Startup organizations from seven nations will be meeting in Ottawa this October to kickstart a global movement to support entrepreneurship, Startup Canada announced today. But so far, it doesn’t seem likely that Prime Minister Stephen Harperwill be there since he has yet to lend his presence (or any other signof support) to Startup Canada, a charitable foundation officiallylaunched March 1 to solicit input from Canadian entrepreneurs and thencreate a plan to build a support infrastructure for them. Harper wouldn’t exactly be going out on a limb to do some cheerleadingfor Startup Canada. U.S. president Barack Obama has been front andcentre at events promoting Startup America and its similarinitiatives(although it is an election year south of the border, so visibilityworks to the advantage of Obama’s campaign crew). 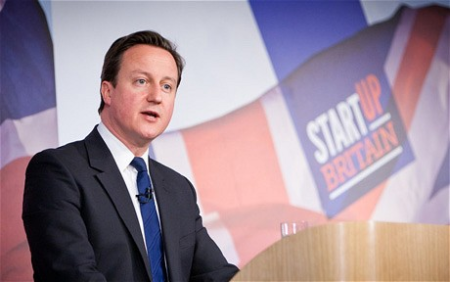 And British PrimeMinister David Cameron has spoken at events held by StartupBritain. British PM David Cameron has lentvisible support to the Startup Britain initiative. Startup Canada has also met with Maxime Bernier, the federalministerresponsible for small businesses, and Governor General David Johnston,the latter of whom was “very receptive,” Lennox says. The group has also had talks with the staff of foreign affairsminister John Baird, she adds. As for securing an official endorsement of Startup Canada’s cause fromthe Canadian federal government, however, so far that hasn’t happened.Lennox, who attended England’s Oxford University, isn’t toosurprised:“Canada is more risk averse” than most other nations, she says, addingthat perhaps Canada isn’t as motivated to jumpstart itsstartup movement because its economy wasn’t as ravaged by the globalfinancial crisis as those of the U.S. and Britain. Two board members of Startup Canada – entrepreneurs Lanis Anthony andRivers Corbett – are at the Global Entrepreneurship Congress inLiverpool, England from March 9 to 14 this week, but are there with nocontingent (or official endorsement of support) from the federalgovernment. “We went (to Liverpool) with our heads down saying our government’s notsupporting us yet. We really want some involvement from the primeminister,” Lennox says. Startup Canada has invited delegates from seven other startup groups –in Chile, Spain, Portugal, Malaysia, Australia, Britain and the U.S. –to convene in Ottawa this October for a strategy meeting, includingdiscussions on how the next World Economic Forum in Davos, Switzerlandcan be used as a global stage to pitch their agenda for entrepreneurialsupport. Startup Canada holds the first of 30 cross-Canada town hall meetings onentrepreneurship in Halifax on March 19.